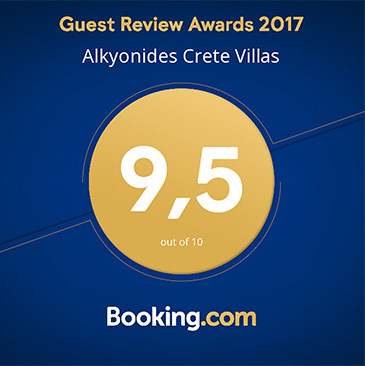 A big thanks to all of our guests who took the time to write a review of their stay at Alkyonides cretevillas! We appreciate your comments and your precious feedback is what helped us win for a second time this Guest Review Award!!! Thank you again for helping us reach this goal! 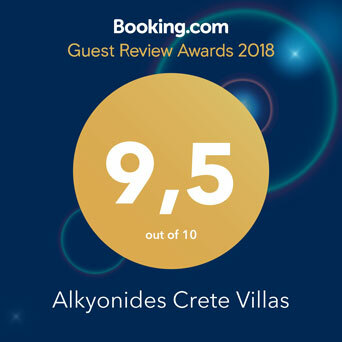 Welcome to Alkyonides Villas in Rethymno, Crete, the beautiful Greek island in the sparkling Mediterranean Sea. Crete is the largest Greek island and enjoys a long, warm season. 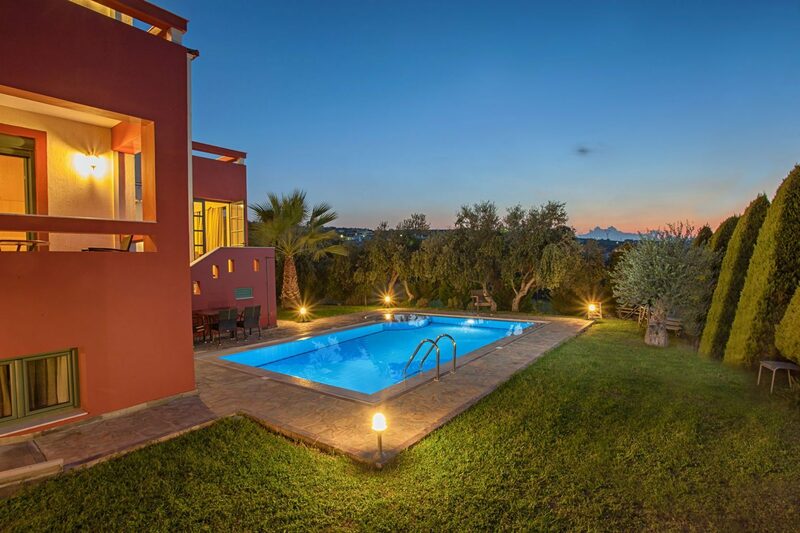 Why don’t you take a tour around and see the wonderful vistas, settings and surroundings of these magnificent luxury villas, lying in an ancient olive grove with panoramic views out to the sea and the mountains as a backdrop. You would be astounded by the beauty of the nature and the hospitality of the locals! Each villa has it’s own private pool and can comfortably accommodate eight people. There is a spacious open plan living room area with satellite TV on the ground floor. The living room area has direct access to the pool and garden area. 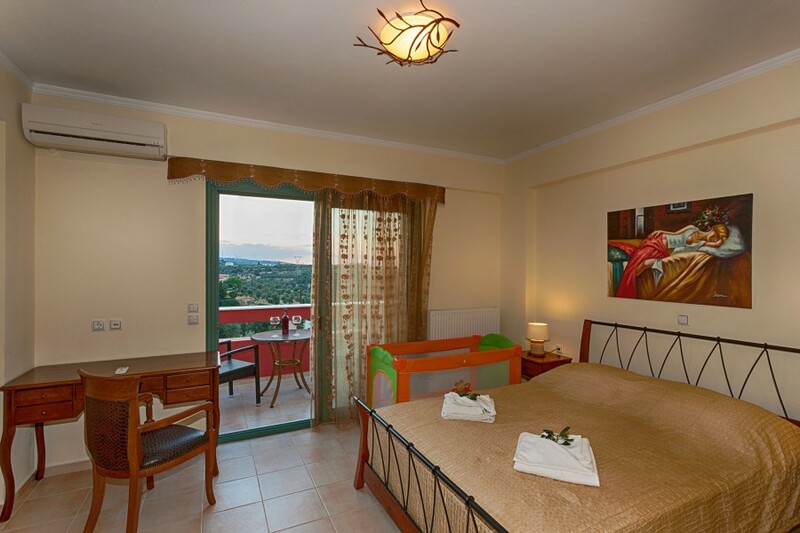 Each villa has 4 air-conditioned bedrooms with own bathrooms. In two of the four bedrooms there are two single beds, which can be also set up as a double bed. 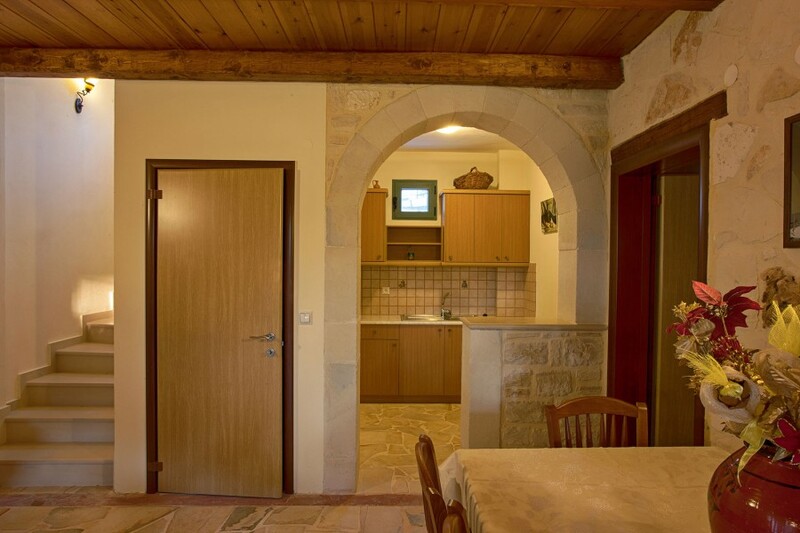 The villa has two kitchens, one main fully equipped kitchen on the ground floor and another smaller one in the playroom area on the lower floor. The main kitchen contains a refrigerator, a gas oven, 4 gas ring stove, a microwave, a dishwasher, a toaster, blender, a filter coffee machine, dishes and utensils and an indoor dining table. 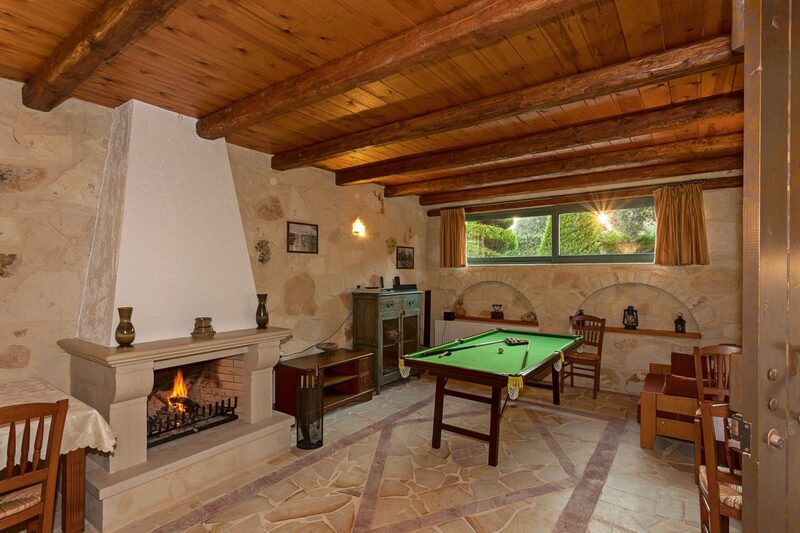 In each villa there is an indoor playroom area on the lower floor which has direct access to the pool area. In the playroom you will find a pool table, a mini soccer and a wooden chess table. 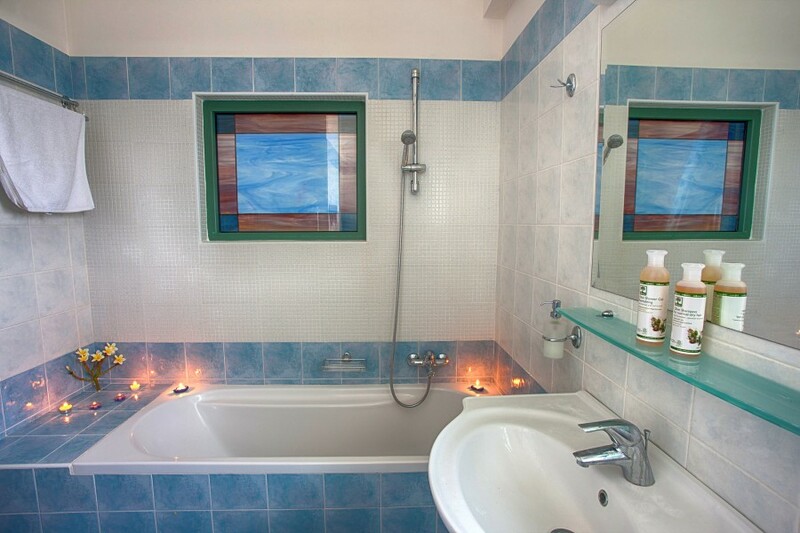 In each villa there are four bathrooms, one for each bedroom. Two of them are en-suite bathrooms and the other two have shower. Each villa has a 36 m² private, ecological swimming pool, which includes a part for young children, surrounded by illuminated landscaped gardens with flowers and trees. Our 300 square meters fenced garden is covered with grasses, trees and flowers! It offers privacy and convenient areas for lazy cocktails and/or dining. 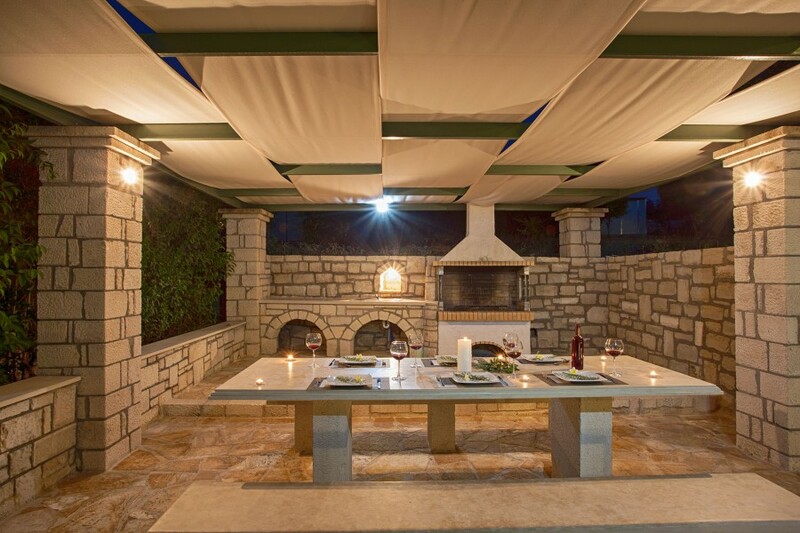 A comfortable barbecue area, next to the pool, where you can enjoy your lunch, dinner or a drink under the candle light or just the starlight. Wonderful villa with great pool. Nice house with great pool, large rooms, clean and new. Friendly, english speaking staff. We liked it! My family and I stayed in one of the villa\’s during August. 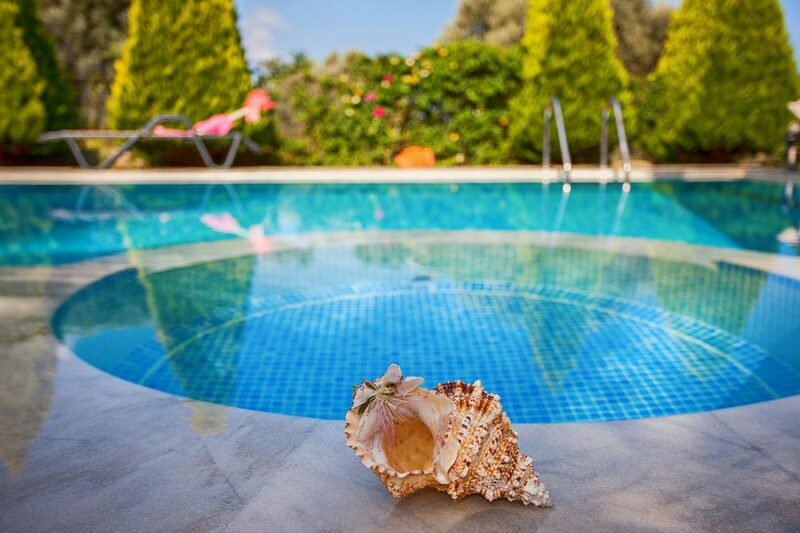 We had great time; the villa is very comfortable, exceptionally clean and Irini very welcoming. My daughters of course loved the pool and we found they spent most of the fortnight under water! The shade from the olive trees meant that there was always somewhere to sit outside without needing to be in the full sun – bliss! And what a BBQ! Steve P.
The villa is in a great location, amongst peaceful olive groves, yet only 10 minutes drive to the town centre. 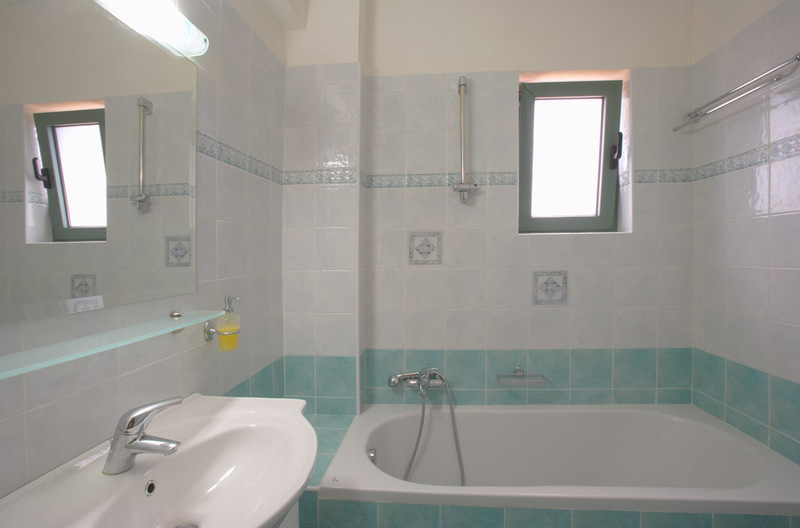 The villa was spotlessly clean, modern, and containing all amenities. It is very spacious and airy, with great air-conditioning. The garden was nicely maintained with a good barbeque area. Highly recommended. George P.
Great property, clean, well equipped. A stunning Villa with beautiful garden and well maintained pool. The outside BBQ area was an absolute gem of an idea. Great location. Up in the hills, and a short drive in to Rythminos. We stayed for 2 weeks with another family and there were 4 children and 4 adults in total. 3 of the rooms were on suite so there was never a wait. Irini the manager was incredibly helpful. 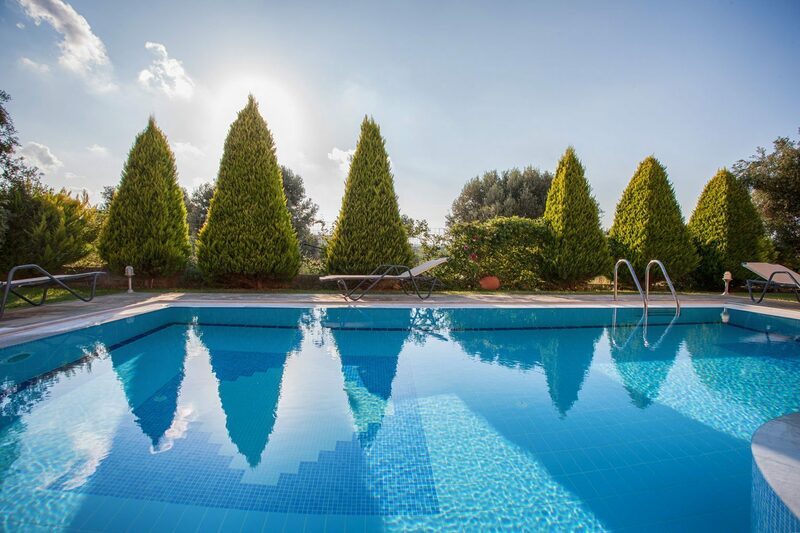 Jason L.
We booked up this villa for a two week holiday for two families of four, one coming in from the US and one from the UK, so all done online and in liaison with Irini, the agent for the landlord. We had high hopes for the villa from the pictures and descriptions online, but you can never be sure and we were slightly nervous of what we would find on arrival in Crete. We shouldn’t have been – the villa is fantastic. Thanks Irini! Perfect, clean, home for family vacation! Accurate description and absolutely no worry/stress booking experience over the internet. 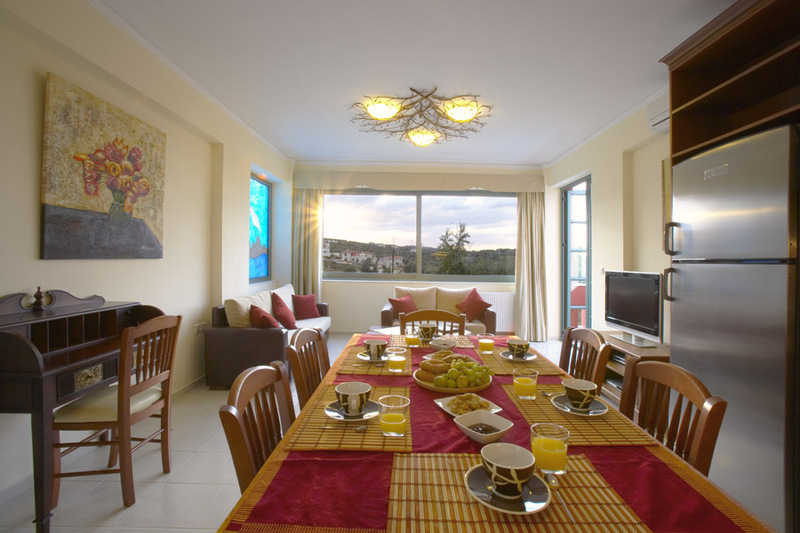 This is a wonderful property that has 4 well appointed rooms for a large family/multiple couple vacation. 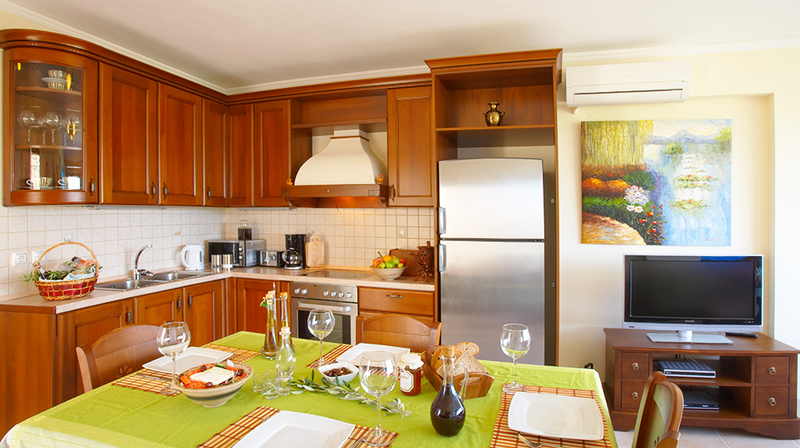 The entire property including all 4 bathrooms are very well maintained and kept meticulously clean. Thank you Irini! 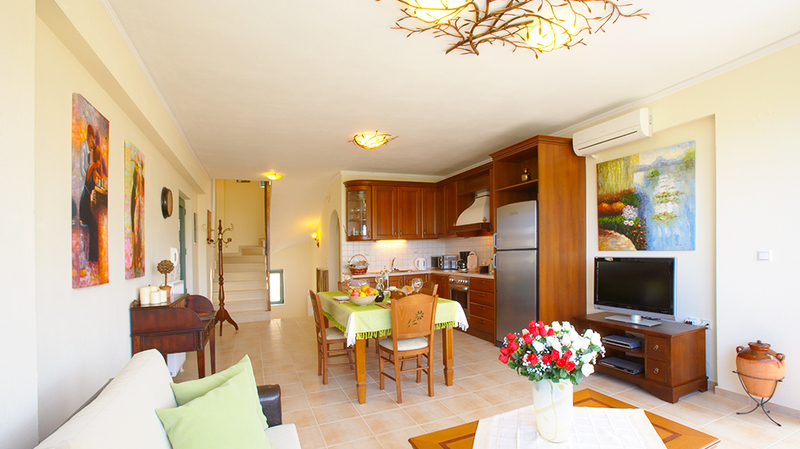 Robert S.
Fantastic villa – very well equipped. We have been there for the second time in arow and our second stay was even more wonderful that the previous one. The villa is fantastic, very well equipped. The owners are very kind and always ready to do you a favour.